Winter knitting has come to a screeching halt. They are lovely projects: a swingy vest, a geometric wrap, a hat I’m making up as I go, and a nearly-finished pair of socks. I decided, quite suddenly, to start knitting for spring and summer instead. I’m not good at that, knitting – or sewing – ahead of the season, so I’m rather pleased with myself for switching gears, but I’m not delusional. I know it’s all about casting on more projects. I know, right? Hours later and your winter projects are a memory, whatever you can use from stash has been measured out, pdfs have been downloaded, printed, and pulled into an app on your tablet, and you are ordering Katydid cotton ribbon from one yarn shop and Hempathy from another because hey, you gotta spread the love. A Vodka Lemonade cardigan in Longmeadow, a cotton-microfiber yarn, from my stash. It’s been there for years, bought for a sweater I started and didn’t care for, and there should be enough. Especially after I frog the unfinished pieces in the picture. I love this Vesper pattern and have wanted to make it for a while. A quick run to The Yarn Gallery in West Reading and I filled my sack with Elsebeth Lavold Hempathy. This brown, with a natural trim at the hemlines, will be gorgeous. More than 400 stitches cast on and some short rows later, I am trying to work quickly through to the arm divisions so it is ready for my next knitting night with friends, when it will just be miles of knitting in the round. This Katydid It Pullover is made from, well, Katydid, a cotton ribbon I used to make a baby gift recently. I liked it so much I wanted to use it for me me me. It’s perfect for a loose, open top for the beach. An order has been placed in a teal-ish shade from Kitschy Stitch in Rehoboth; I’ll pick it up next time I’m there. 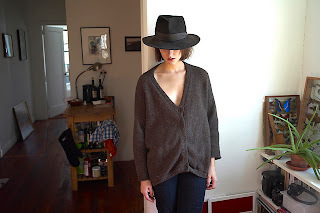 Someone on Ravelry made this without the sleeves, just letting the shoulders drop off, and I may do that, too. Another bandana cowl from Purl Soho, this time in Twice Tweed, (again Elsebeth Lavold, but I think it’s just been discontinued) a recycled blend that feels more like cotton but has a bit of wool. I think it will be great for spring biking, skiing, and dog walking. This is a fast project, and I’m going to hurry up and get this one done because Spring might be ready to spring. Maybe. My plan has integrated time management, by the way. Vesper is a mind number, so it’s for knitting group and movie watching with my husband. The Vodka Lemonade needs slightly more attention so I’ll keep it for time by myself listening to an audio or just focusing on my thoughts. The bandanna is small and will be going on car rides and in my purse, and the pullover will be a fast project. Now that I have publicly committed to these pieces, I’d best get to work. A whole lot of Fridays have passed since my last FAF post, and I have knitted through many of them, but summer will do that to you. Running the fiber gamut this week, including a strange mixing of Wool Ease (a color my daughter loved, wool and acrylic) and Fleece Artist Peter Rabbit (a warm angora/nylon/wool) to make a fantastic top-down Trapper Hat. My daughter will be exploring Icelandic climes this fall and needed a protective shield while she is so far from home a hat. Peter Rabbit is unbelievably soft and makes a nice contrast to the Wool Ease. Stephen West’s Spectra scarf has been frogged and recast, using the same lovely cotton from Wolles. I set this aside some time ago because didn’t like the way it was turning out; after glaring at it for a while I changed to a much smaller needle and we are speaking again. It’s a nice pattern to work, and the slow change in the yarn color adds excitement. Yes, excitement. See there, how one strand of brown changed to tan? Here’s to fall’s approach, although it’s pretty warm & humid today. Maybe next Friday. My brother gave me this fantastic vintage Norwegian sewing box, a little mildewed but otherwise in perfect condition, from his friend Ed the Barber. It accordions out to a ridiculously long length and is great for all my needles and tools. All of them. In one room. In one place. This picture, while not particularly attractive, gives an idea of how long it is when opened. Everything is together now, my beautiful, organized, no longer misplaced collection. I’m so excited! I know where everything is! Once upon a time I ran around the house and gathered all the yarn, had a serious talk with it, and since then it has mostly stayed in its place. Mostly. That was then, here. Cute sculpture, empty Knit Picks cases, filled containers. One pocket of one bag among many. One of several, albeit organized and sorted, vases and containers of straights and dpns. Tiny cabinet stuffed with stuff. Enough? Familiar? It’s done! Wait until you see my collection neatly organized! *This is what my husband said to me once when I told him I had to stop at the yarn shop on our way out for, of course, the right size needle. I love him, but he is not of my tribe. Last summer, on an extended vacation in the mountains of Colorado, I started a shawl. I didn’t want anything heavy or complicated, or even a pattern to tote around. A gift certificate for Elisabeth Drumm’s beautiful color changing yarn was burning a hole in my knitting bag, so I ordered a few skeins in shades of green, packed a long circular, and planned to complete the whole shawl during the month-long vacation, and the additional week of motel evenings during drive time. I cast on about 300 stitches started knitting. Yarnover here, double wrapped loops there, knit a few rows, whatever. No fancy stitches, nothing to think about, no gauge. Indeed, the length of it will be a surprise. It’ll be fine. I’m looking forward to washing and blocking to straighten out the stitches. The shawl was pushed aside over the winter in favor of woolly projects, and I grabbed it out of a basket a few nights ago and decided it only needed a few more rows and the width would be just right; a wrap for chilly movie theaters and summer nights. Knit a few rows, bind off, give it a wash, and go. But I decided to add a ruffle. Just a simple one, but perhaps something relatively deep. Couldn’t leave well enough alone. I knit a row of yarnovers between each stitch and now have, of course 600 stitches. It takes a long time to knit 600 stitches. Let’s jump right in with a fail. Nice job on the matching stripes, though. These purple socks, while a lovely colorway in the very sturdy, yet soft, Indulgence yarn, are just bad. I don’t love making socks, but I have made dozens of them – beautiful dozens – over the years for myself and my handmade-sock-loving-family. It has been a few years since I made any, but when I saw this yarn I bought a few skeins and made a Sock Plan. I plunged into the purple and discovered, immediately, that I had lost my sock mojo. How long do I usually make the cuff? Which rib? How high is the leg? Didn’t I used to stop the pattern an inch above the heel? What was that heel I like? What’s the trick for preventing a hole on the gusset? It went like that. They are done, and wearable, but…you know. On to the second pair, and now that my brain has rebooted in sock mode, it’s good. Great wintry colors, a better gauge, and I’m fitting them to the wearer’s foot, which is always nice. These colors are a snowy day, yes? In other fiber news, my mom, a crocheter, has been making dozens of hats for a children’s hospital, and these beautiful blankets for Project Linus. It’s my job to wash and deliver them to a local collection point. So pretty. I voted for this design! Yep! The new project bag from Ravelry, the result of the design contest. And how about this sticker on the package? I’ll be peeling this sticker off to use somewhere else. My love of stickers has continued since the gold stars of my childhood! Finally I made this Kindle Cover for my etsy shop, and I love it. Enjoy the rest of your Fiber Arts Friday wandering over at Wisdom Begins in Wonder! Fiber Arts Friday the 13th! Ah, a Fiber Arts Friday with stuff to share! First up, Dillon’s Longies, which I think of as Dillongies. 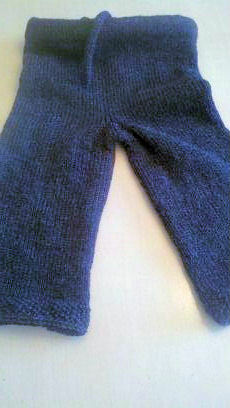 I made these for a neighbor who lives in these comfy wool pants, longies for winter and soakers for summer, over his cloth diapers. I was shocked to find that they took a little more than two skeins of Cascade 220, and rather longer to knit than I expected. Worth every penny of the many pennies his mother pays for them! I swatched this Valley Yarns cotton/microfiber from my stash for a possible cardigan, but it’s not going to work. I will store the swatches with the yarn for next time, with a note that I washed the swatches and they didn’t budge. Every now and then I make a square of sock yarn for this eventual throw. Yes, it’s going to take forever, but it’s not only a good use of odds and ends of yarn, it gives me something to buy when I visit a yarn shop and don’t see anything else! You know how it is, you want to be supportive of the friendly shop owner but there isn’t one thing calling you? I can always find a pretty sock yarn, and I can tell my husband it’s a vacation souvenir and not a yarn purchase. It’s been such a long time since I worked on this (it usually lives in the car for emergencies) that I had to search for the original pattern online to figure out how I did the increases and decreases. Right, forever until it’s done. Summer is a good time for sock knitting, and I’m getting a few things ready. I bought these two gorgeous sock yarns at The Knitter’s Edge in Bethlehem, Pennsylvania. I love that shop and wish it was closer. I will be dividing these into two toe-up balls with matching starting points, because that’s just how it has to be. This yarn is super soft. My daughter-in-law brought this gorgeous skein back from Trieste, Italy. I’ll be casting on a pair of socks for myself this summer, too. 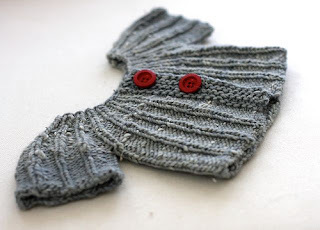 Yoked Cardigan, Hannah Fettig, from baby to adult sizes. Finally, I knitted and donated a dog sweater for Pottstown’s Bark for Life, I sewed a few Kindle covers for my etsy shop, and got a signed copy Wool in the mail yesterday. 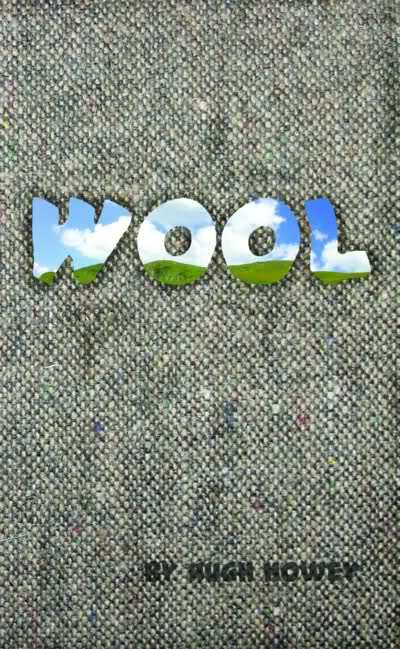 Check this post for a review of Wool! 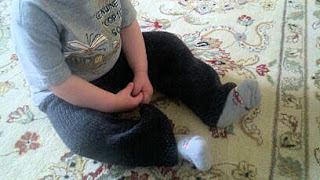 I’m off to explore other Fiber Arts Friday blogs! Knitters are diverse. There are girly-girl knitters, geek knitters, grandma knitters, hipster knitters, nerdy knitters, and conservative knitters. A quick run-through of knitters I know gives me pagan, pastor, teacher, seamstress, software engineer, social worker … kind of fun. Knitting brings us all to the same table, where I’ve noticed at least one other commonality: we read. During a gathering, once we’ve checked out what everyone else is making/frogging, commiserated with this one and congratulated that one, and after acknowledging yet again that we really can’t cable and talk at the same time, we talk about books. I have yet to sit with a group of knitters without ipads, phones, and Moleskines being whipped out of knitting bags to jot down the book titles that start flying around the room. We’re a literate bunch. We knit and we read, and while I’m not willing to go so far as to give the collective “we” to a genre, I’ve noticed that a lot of us read sci fi. 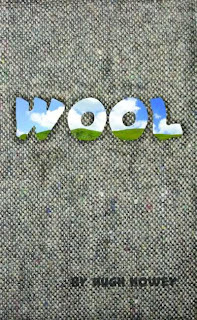 So have you read Wool? I started to think that Howey either knits or is close to someone who does, and I was right. I read the first book, Wool, and then immediately bought the Omnibus, with the first five stories. (God love a Kindle for instant gratification.) Go get it, in print or on your Kindle . Then you’ll go to his website and discover, as I did, that there is an imminent sixth story, and that there is much more to discover about Howey, his fans, and his work.